Lindsay Mason: Trade show, telly and time flies! This could be a loooong post! Lots of pictures to share, well, a few of them anyway, and tales from the trade show and the telly studios. The time just flew by and it all seemed to be over as fast as it began. As this is the one time of the year that I get to meet colleagues and friends I always hope the time will go by slowly, but it always races faster than ever. So, the first picture is of some of the samples that I made for the shows, all piled up and ready to pack. There are cards, boxes, candles, chocolates and more! This was the first time that I had to prep QVC samples at the same time as those for Stitches, so it was a slog to get everything made. David drove me down to Birmingham and checked me into the hotel where we met my good friend and colleague, Jan, who is Personal Impressions area manager for Scotland and North England. We then went to the NEC where the PI team were already very busy setting up the stand which is one of the biggest in the show. David and I said goodbye and then Jan and I began helping to get things ready....or so we thought! Ranger and PI had collaberated in two half day workshops for our customers and there were just two places available as the ladies who had booked had not been able to get there. So Jan and I were able to go along and enjoy the three hour afternoon session. Did we feel guilty about leaving everyone else to set up?.....er....no!! The first hour was with Suze Weinberg using the Melt Pot and we made a selection of UTEE pieces. Next was Claudine Hellmuth and we used her new range of acrylic paints, mediums and sticky backed canvas. Lastly was Tim Holtz with alcohol inks and the new yummy Distress ink pad colours. We inked, painted, melted, glued and distressed and ended up with a stack of samples which we then attached to framed mirrors which we had colour washed. As you can see, the results were fabulous and this little beauty will be accompanying me to my Ranger demonstrations. The great thing is that, even though I am a "certified Ranger educator" (no clever remarks please!) and demonstrate the products regularly, I still picked up new ideas and had my enthusiasm tweaked up a few more notches! On a more serious note, I had been concerned about a magazine project which I saw somewhere, some time ago, and have noticed people on various forums saying that they were going to try the technique themselves .....this was using alcohol inks to tint UTEE in the Melt Pot. I asked Suze about this and she confirmed that this is a complete no no. So, please, if anyone is thinking of using the Melt Pot, you must only use To Dye For inks to tint the UTEE as they have been specially formulated for the purpose. Even if other inks appear to "work" in the Melt Pot, fumes are invisible and could cause problems. Okay - back to the fun now! Here is one of the cards I made using some of my new stamp designs - this is a quirky bird from the "Knotty & Friends" clear set, and there is another set of them called, wait for it....."Trotty Lotty Botty"! I should explain - when I design I give working titles to each drawing and sometimes the names are used but often they are given new ones. When I did the birdies I started using rhyming names and was running out by the last couple, so we ended up with the above! I like it that PI have a sense of humour though, and it was a talking point at the show! The background for this card was made with Ink Potion no 9, gloss card and dye re inkers. Lovely bright shades. I was teaching versions of this card in my workshops on Sunday and Monday and demonstrating for the rest of the time. It's when I get to see all the retailers from all over the country, and overseas, in the one place, so a lot of catching up goes on as you may imagine! yOn Sunday night was our traditional, annual night out at the Wing Wah Chinese restaurant. It's always a real hoot with around twenty five or so of us having a great buffet meal, chatting, laughing and hopefully not talking shop too much! One of the traditions is the "initiation" of any new guests at our tables...a nice, if slightly embarrassing initiation! There is a sudden burst of the Happy Birthday tune and then the waiters approach the newbie with a large ice swan filled with ice cream, surrounded by fruit and topped with a giant sparkler. Everyone joins in with singing and clapping as the recipient sits there, rather surprised as it isn't their birthday of course. Daft, but fun! 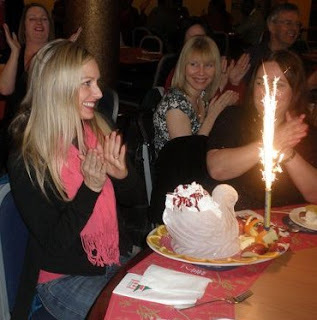 This year it was Claudine (Helmuth) who was our newbie....that's me behind the sparkler! Claudine loved the surprise - I think! At our table we chatted about our pets, present and past, and Claudine and I found that we both have nightmares about our long tresses being cut off! Next day it was back to work with workshops, demonstrations and business meetings. Most of us went without lunch after the big meal and then a good breakfast, but ny 4pm we were all beginning to feel ravenous and the show goes on till 6pm. So, it was time for me to break open the emergency cupcakes! (I had made one of my boxes featuring cup cake images and there was a cake inside it, so I brought extras with me in case that one got pinched. Here are Elaine from PI and Joella who had come over from Pergamano to be with us on the stand.both tucking into a tiny cupcake each. Elaine is one of the most wonderful people I have been lucky enough to know, an absolute treasure. Here is a not very good picture of the Ranger gang getting ready to head down to QVC on Monday afternoon. Tim was launching his TSV at midnight, so we all promised we would saty up to watch that night and wished them all well. By the way, Mario (Tim's wonderful assistant) was actually wearing long jeans as opposed to his trademark knee length shorts....mind you, we did have 4" of snow in Birmingham! Monday evening was spent having a quiet (ish!) meal at the hotel and then lots of telling of stories and laughter to keep us going until we could watch Tim on QVC at midnight. We all huddled round a laptop as they couldn't change the channel on the big tv in the hotel bar. Hope we didn't make too much noise as we were cheering for Tim of course! Not that he needed our good wishes as, of course, his products had been so long awaited! Below is a picture from Tuesday morning which shows Malcolm, and a huuuge cake that was given to him as it was his 40th anniversary with PI! Dawn mentioned him on air and it was announced at the show too! I made a card which we all signed of course. Next to Malcolm is Kathy and behind her is one of my best friends, Jan. We are like the terrible twins when we get together! Here are snaps of a couple of the cards I made with some of my new stamps. I'll post more new images of these as and when! Thoughts of an exotic summer amidst all the snow here! On Tuesday afternoon myself, Rachel Grieg, Shari Carole and her husband Tom all set off on the train for London and QVC. Rachel and Shari were snapping away as we drove through London in the cab! Look who was in the Green room when we arrived - Tim was relaxing before going back on air. We had to sort out all our samples and get organised ready for the "All Star Stamping " show at 7pm. Here is Amy - with frog slippers! - taking my picture taking hers. I liked the way that she matched the collage on the wall! Amy is another of my favourite people - supportive, funny, kind and also a really great mum. Next you can see Shari and Rachel setting up their demonstrations very quietly! If you can imagine, there were about seven of us all, including Paula and me, setting up in silence as we were in the live studio - well, trying to anyway! As you can see, there wasn't much room! All too soon we were trying to get ready to go on air, slapping make up on....not even time to do my nails after all the inkiness of the weekend....getting changed an miked up. I was up first and, though I felt fine all day I have to admit that I did feel rather disorientated once I was on! It was a combination of the small demonstration area, everyone else being in the studio watching me, having Dawn on one side and Debbie Flint on my other side....oh well, I know I'll be able to take whatever is thrown at me next time! Thankfully all my stamps and the inks and glitters that I was using just about sold out, so that made me feel better! Dawn is absolutely fantastic as she can find the word that has mysteriously escaped one's brain, fill in the silences that you may experience and generally guide you through. I don't think that everyone appreciates how very hard Dawn works and what a lot of pressure is on her to make everything flow smoothly. This craft day was her first without Jj to help her for seven years, so it was even more stressful than usual. I know that we all were amazed at how she keeps going for a whole craft day and Tim and Mario were very complimentary about what a star she had been. What a busy few days you've had, as Cindy says, pretty exhausting - but really interesting to see "behind the scenes"! But I'm sorry, Lindsay, I already told you - forget showing that mirror frame round in your demos, I want it!!! LOL! Sorry I didn't see you at Stitches, Lindsay. I kept coming back to the stand, but you were never there!! Did see you on QVC though (and bought Tim's book in the process). So pleased your stamps were a sell out. Well done!